This post written three weeks ago: I forgot to publish. Since then there have been reports of unilateral loosening of immigration rules by the White House. The noise from Washington regarding immigration reform has been clamorous of late. In the legislature, Republican leader "Caveman" John Boehner is preparing to cave in to the Democrats on "amnesty" as per his usual behavior. President Obama is pulling the trigger on plans to declare a new national park on the border with Mexico. This effectively opens the US border to all comers including drug traffickers. Perhaps the latter is precisely the point: we know from the work of Michael Ruppert and others that various branches of the federal government profit hugely from the illicit drug trade. This trade has been harmed recently by a rash of local marijuana legalization initiatives: Washington can't have that. As for "amnesty", perhaps the strongest proponents (as far as I can see) are a mixture of far-Left ideologues (for whom anything of value must be given indiscriminately to all), business interests (for cheap labor), and perhaps even high-level globalist conspirators (seeking to dilute "American culture" and create a "North American Union"). Why the labor unions aren't screaming bloody murder over the "amnesty" push is a mystery to me: Cesar Chavez himself was anti-immigration because he well understood that unionization solely relies on making labor scarce. My own position echoes that of Ron Paul: let everybody in but get rid of welfare and the minimum wage laws. Removing the minimum wage will maximize employment. Removing welfare restores what we had before welfare came along: fewer freeloaders and more private charities to assist the truly needy. Cultural conservatives looking to preserve the cultural/ethnic identity of America have already lost -- their best bet is to concentrate geographically and perhaps create a "conservative" version of the Free State Project. This is the USA Sibley Chart with transits for the day Obama announced his impending approval of the national park plan. It gives us an overall flavor for the energies of the time, and also a hint about the plan itself. Solar Arc Neptune approaching USA Vesta: Investment (Vesta) in the US labor force (Sixth House) involving foreigners (Neptune)? Solar Arc North Node at IC: A long-term strengthening of cultural conservatism? 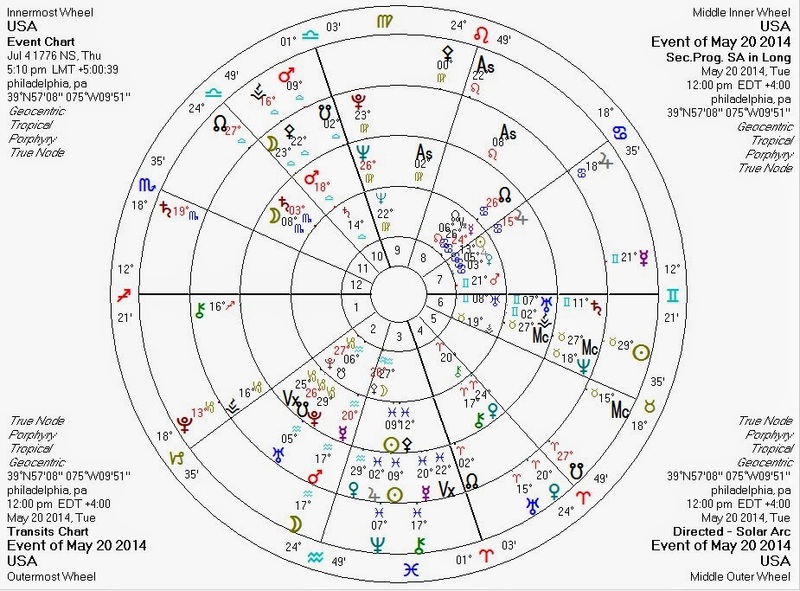 Transiting Pluto opposite USA Sun: An existential threat (Pluto) to national identity (Sun)? Transiting Neptune approaching USA progressed Sun: The Neptune retrograde station in early June will most certainly have some effect. Will it be regarding identity (Sun), short-distance travel (Third House), and law and/or long-distance travel (Ninth House)? Transiting Uranus in USA Fourth House: Shakeups (Uranus) regarding home/land/race/culture (Fourth House)? Transiting Saturn entering USA Twelfth House (in the fall): Struggle/solidification/achievement (Saturn) regarding that which is foreign (Twelfth House)? Transiting South Node into USA Fourth House: A shift to the cultural Left for a couple of years? A loss or dilution of cultural identity (possibly related to immigration)? Transiting Mercury conjunct USA Mars: News (Mercury) of action (Mars) regarding "others" (Mars in the Seventh) and land (Mars rules the Fourth).